This entry was posted on November 8, 2016 by Y Hasegawa. 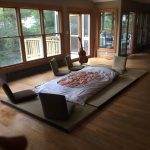 Tatami Mats Required? What Should I have Under My Futon? Do I need buy tatami mats as well? One of the topics that definitely gets the most questions about is the surface under your futon. I intend to create an additional video for our Futon Guide regarding this, but for now I thought I’d create a blog post on this topic to answer this questions in detail. 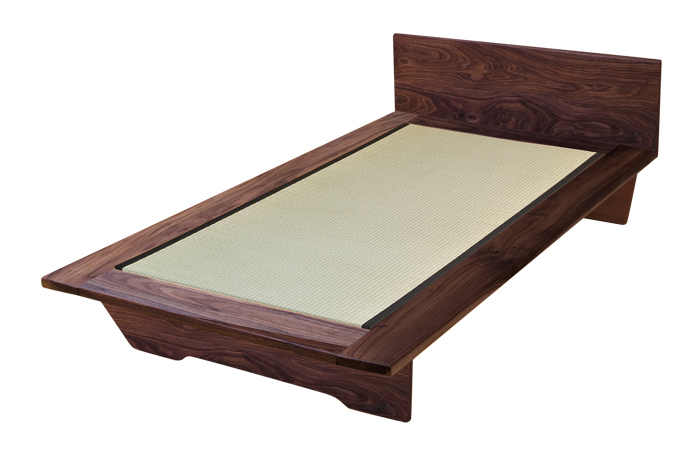 A great looking, simple tatami bed. One advantage of platform and tatami beds is they help keep your futon away from potential moisture problems simply by getting your futon up off of the floor, which can be a plus. 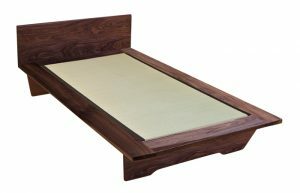 That said, both tatami beds (wooden bed frames with tatami as the top surface) and platform beds (which typically have flat wooden top surfaces) are definitely quite firm. 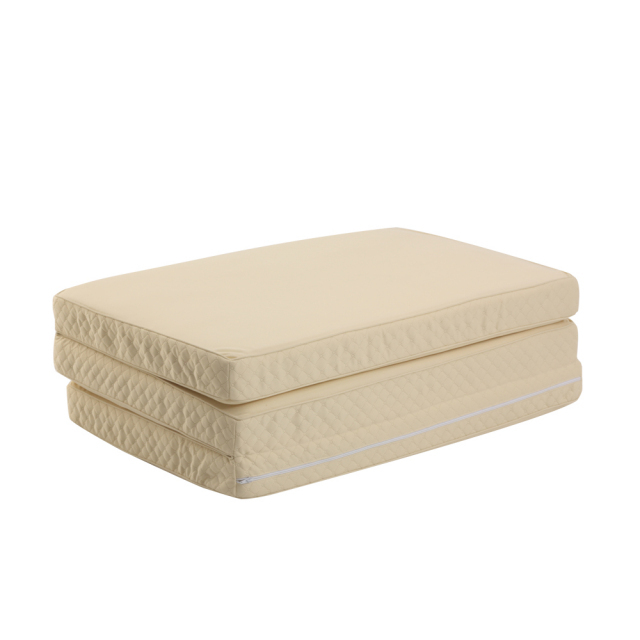 You may need to use a trifold pad under your futon when using these options as well. 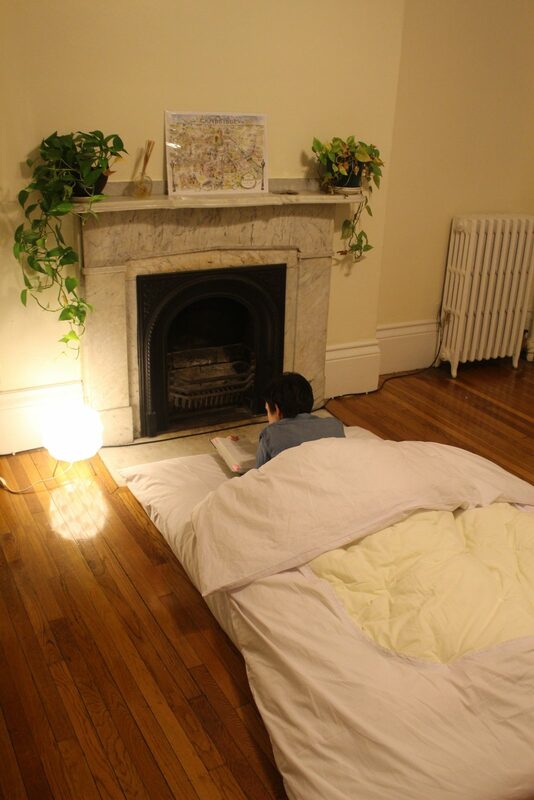 Of course the disadvantage of these beds is . . . well, they're beds. You can't just fold up up and store them away like you can when you have just a futon. Use a trifold pad with or without a tatami mats. Of course another important factor is you, your size/weight, sleeping habits and the type of sleep you need. If you're looking for quite a firm sleeping surface (due to back pain issues, for example) then your futon on a blanket directly on carpet will probably be good. However, if after a few weeks you feel you need a little extra cushioning, I would recommend ordering a 3-4 inch trifold mat from Amazon (or similar vendor). Everyone's backs and sleeping habits are different, so I'd suggest starting with the futon only at first for a couple of weeks then adding any additional padding as necessary. Is your Futon Placed Directly on Carpet Okay? Whether your futon works well or not on carpet depends on a couple of things. First, is the carpet covering a cement floor? Carpet on cement can be quite unforgiving. How thick is the carpet and carpet padding? How old is the carpet? If the carpet pad underneath is worn, it may not be a very good moisture barrier either and your carpet may be pulling moisture from the cement. (This is often the case when you smell that musty carpet smell in basements.) Eventually your futon will actually absorb that moisture from the carpet. I would recommend some sort of pad underneath if only just a folded blanket that you can throw into the wash with your futon covers while you're hanging your futon out in the sun to get air and dry. If your carpet is installed over a wooden floor, moisture would likely not be an issue at all. I’ve gotten mixed feedback on this and I believe this basically comes down to comfort. 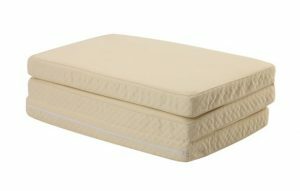 Whether you will need additional cushioning under your futon or not depends upon your weight/size and sleeping habits. I have had customers who have loved their futon directly down on a hardwood floor. One customer wrote me and said that it was a bit too hard directly on the hardwood, but he simply added a thick throw-rug which was a perfect solution for him. Finally others have needed the trifold pad to fit their complete comfort needs. Other than comfort, your futon directly on a wooden floor would not be a problem other than the dust/dirt that commonly accumulates on wood flooring may be. Important: One additional issue with flooring as we've gotten some additional feedback about mold on the bottom of futon that have been placed on hard-wood or "Pergo" style laminate flooring. (This is still quite uncommon so it may have something to do with the type of material it is made from.) As we've looked into this we found that wood flooring tends to get cold but the futon remains warm and the temperature difference may introduce moisture. Or it may simply be because the wood or laminate doesn't allow the futon to breathe. Regardless of the reason, we would recommend that if you're placing your futon on a hardwood or a laminate flooring, that you use some sort of absorbent pad or throw-rug underneath. We would also recommend that you frequently (or possibly daily) lift your futon up off of the floor and drape it over a chair to allow it to breathe. 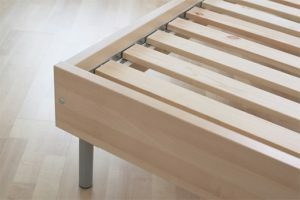 Example of a slatted bed base. wooden "slat" bed frame they already had. The challenge with these style of beds is they're typically made for the Western style futon that is much thicker than traditional Japanese futon. Because of this, it is likely that you could possibly feel the spaces between the slats. Of course, this really depends upon the bed and how far apart the spaces between are. All that said, the solution is fairly simple. You can get 1/4" Masonite (also known as "hard board") to place over the slats. This is that wood you often see that has the holes in it to be used for hanging tools from pegs. It is inexpensive and most venders (Home Depot, etc.) will cut this to your specs. Once again, I'd recommend testing with your new futon first before heading off to the hardware store. Perhaps you'll have no problem at all. I think the bed example in the image above would have no problems, but I've seen other beds where the slats are quite far apart. 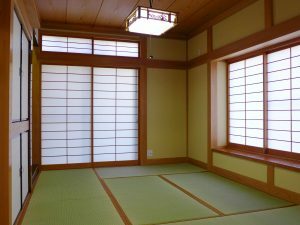 If you do a Google search for "tatami" or "authentic tatami" you will find some tatami that will likely ship from within the US. However, you will have no idea of the quality or if they were even made in Japan or not. These days (just like with futon) there are a lot of cheaper, inferior "knock-offs” available online. 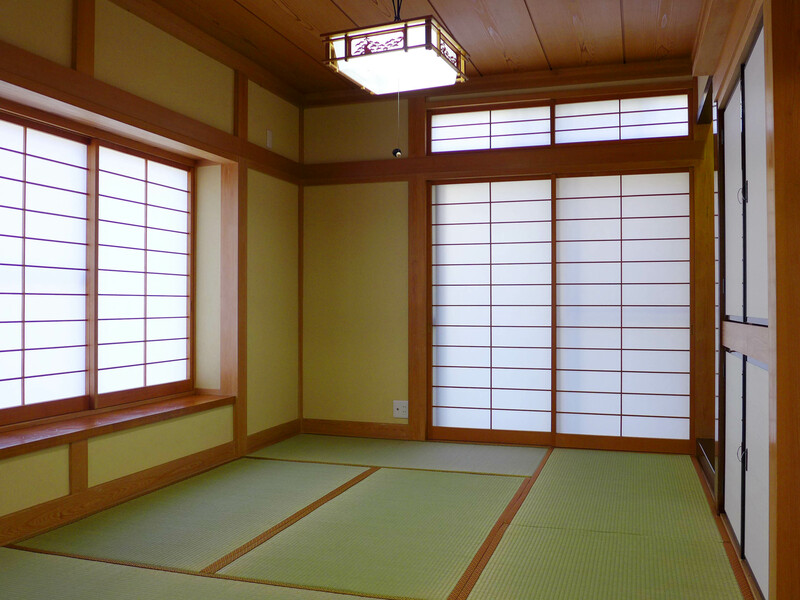 If you do find some authentic Japanese tatami, they will likely be more expensive. Yumi's (my wife) grandfather was a true tatami master. He made futon for over 50 years! In fact parts of the house we live in now—though since remodeled into living space—used to be a tatami factory. A while back Yumi shared with me something about tatami you might find interesting. 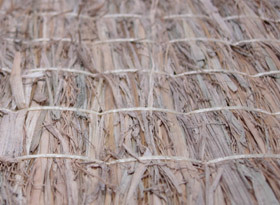 The grass that authentic tatami are made from actually has herbal properties that are calming and help you sleep. So having your futon on tatami and breathing it's scent is an "aroma-therapy" that will help you relax and rest better. The problem with cheap "knock off" tatami is that you really have no idea what grass the may be using to make them (along with other quality issues, if course). humidity put the tatami scent in "over-drive" and every Ryokan had a very strong earthy tatami smell throughout. I loved it! Nice and informative article! I did not know about the "aroma-therapy" properties of tatami mats! They do have a strong smell indeed. Last month when I stayed in a Japanese room in my hotel at first I thought I accidentally booked a smoking room, but it turned out it was the tatami! I guess the strength of the smell depends on the conditions of the room. Cheers!